Abciximab is useful as an adjunctive therapy in patient during percutaneous coronary intervention as well as treatment for patient presenting with acute coronary syndromes. 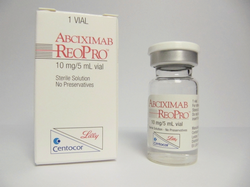 Abciximab is will bind to the glycoprotein IIb/IIIa receptor complex. Glycoprotein IIb/IIIa receptor complex present on the surface of the platelet. Abciximab will prevent the binding of von Willebrand factor and fibrinogen to the receptor. In this case, the platelet aggregation will be impaired. Abciximab may lead to thrombocytopenia as well as bleeding.